From the London Gazetteer and New Daily Advertiser, Feb. 2, 1767. 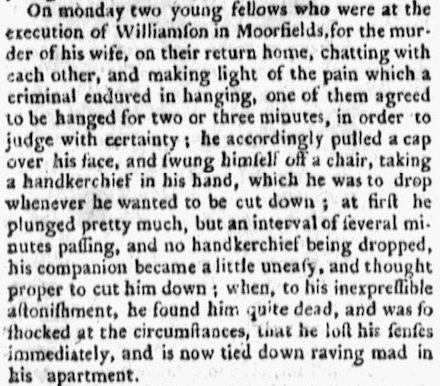 An Account of the CRUELTIES, exercised by JOHN WILLIAMSON on his wife, whereby she left her life, and for which he was lately executed in Moorfields. JOHN WILLIAMSON, Journeyman Shoemaker, a widower with three children, who all starved together in a garret in an alley in Little Moorfields, found a woman who had upwards of 60l. weak enough in understanding to marry him; but she did not bed with him above two or three times; yet they continued sociable for two or three weeks. But the poor woman soon after finding herself ill-used, and denied common food, made complaints to some neighbours; which he resenting, debarred her from going abroad. The wife being subject to fits, used to turn up the whites of her eyes, at which a neighbour, and Williamson’s daughter, of fifteen, pretending to be frightened, he thought proper, when he went out, to tie a rope around her waist, and fastened it to a post near the bedstead: but afterwards he procured some hand-cuffs, which were put on in the daytime, and she permitted to sit on a trunk. Besides having fits, and turning up her eyes, she once drank a dish of tea left in the pot for the little boy, and filled the pot with water; she slapped the boy’s face when he had done a fault; the husband once missing a pair of soles, he supposed she must have made away with them; she struck a light with one of his working knives; she often begged of him for victuals; and he as constantly beat her for it, and once when her husband had been out with other company, and returning about nine at night, her usual time of going to bed, she was found asleep, which was reported to be drunkenness. These things were thought sufficient reasons by her husband to hand-cuff her, with her hands behind, and tie her up in a closet; he tied a rope to a staple, put it through the hand-cuffs, and drew it up to a nail over her head, so as to cause her to stand on tip-toe, and left her in that condition and posture for near a month together, without being set down or going to bed — not even when she was in fits. Her husband gave her every day a bit of bread and butter, laying it on a shelf she could easily reach with her mouth, when she could not, sometimes they would put it close; they used to hold water to her mouth while she drank. When she asked for more bread and butter, the husband would not let her have it. She was also beaten, bruised, and wounded, and frequently sluiced in the face and all over with cold water. Want of every necessary, and the repetition of the above cruelties, were too much for a woman, and she sunk under them. The day before she died, she was let out of the closet, and offered meat when she could not swallow; she was also then allowed to warm herself, but in ten minutes she was told she was warm enough, and should sit there no longer, but must get into her kennel; she staggered to the closet, and the door was shut; she fell into a delirium, and died in strong convulsions in the evening. Item from the May 18, 1767 Boston Evening Post.